There’s a golf course on the northern shore of Kauai where sunrises are celebrated by the unlikeliest of golf ceremonies. On Mondays and Wednesdays, a dozen people gather on Princeville Makai Golf Course’s most famous Par 3 to practice yoga amidst a backdrop that is second to none. Yoga Specialist Tulasi Adeva found Princeville Makai’s signature 7th hole to be the ultimate setting for tapping into Kauai’s spectacular trifecta of energy, ocean, and mountains. In fact, Makai’s entire 7,200-yard layout is so stunning that National Geographic Traveler ranked it to be one of the Top 5 golf courses in America. 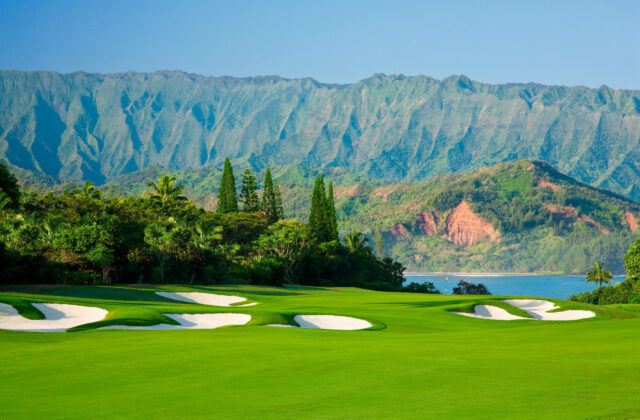 For those who travel to Kauai for more traditional golf purposes, you’ll find the Robert Trent Jones Jr.-designed Princeville Makai to be a heaven on earth. If there is any doubt that Kauai is special, not only for a vacation but for planting island roots, consider that the globetrotting Trent Jones Jr. planted roots of his own by purchasing a home that’s within shouting distance of his Makai creation. When General Manager Doug Sutter came on board at Princeville Makai in 2013, his goal was to stretch his new workplace’s audience. Sutter thought that if Makai’s 7th hole was good enough for his own wedding ceremony, then imagine what this Pacific Ocean hugging peninsula could do for yoga enthusiasts. Sutter took this audience expansion a step further by adding a Sunset Golf Tour to maximize Princeville’s epic sunsets. A guide leads guests first to the Makai Grill for Happy Hour, then on an 18-hole tour with strategic stops for photos, romance, or just absorbing the aura emanating from the Bali Hai mountain range and Hanalei Bay. Princeville Makai is one of those courses in which each day adds a new chapter to the mystique shaping its personality. With no fewer than five ocean holes, the witnessing of whales breaching or dolphins dancing is a uncommonly common occurrence. Makai offers enough birdlife to make a zookeeper salivate. Nene, Albatross, and Brazilian Cardinals all call Princeville Makai home. Of course there are spontaneous rainbows that pop up out of nowhere. There’s so much to see you’ll need a special golf cap that turns 360-degrees in order to not miss anything. 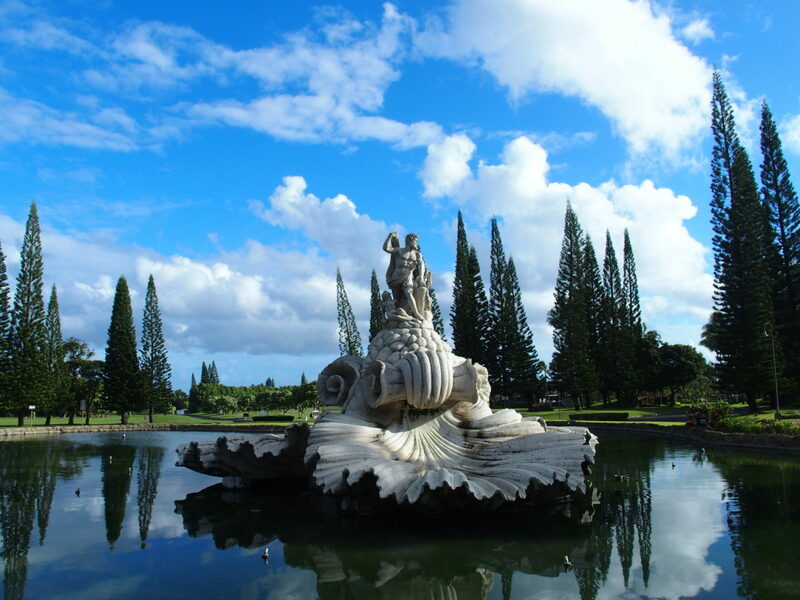 When a visitor enters the luxurious Princeville locale for the first time, the entrance is enough to make you wonder, “What does Makai golf do for an encore?” Where else in the world does a towering statue of Poseidon, the Greek God of the Sea, greet newcomers? Every meticulous detail of the Princeville community lures you west toward the Princeville Makai Golf Course and its luxurious hospitality counterpart, the St. Regis Princeville Resort. The serenity factor is off the charts at Princeville Makai. 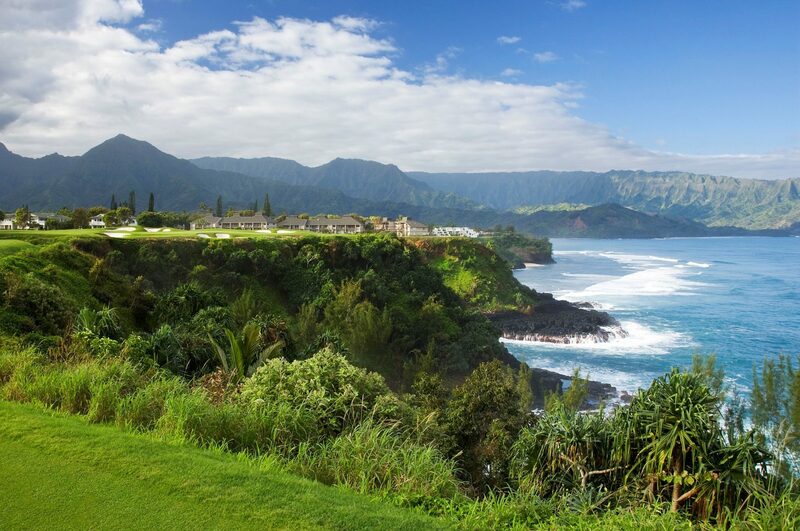 With the Makana Mountains buffering one side of the course and the Pacific Ocean on the other, it’s hard to imagine another course that tweaks a golfer’s five senses like Princeville Makai’s amazing ambiance. 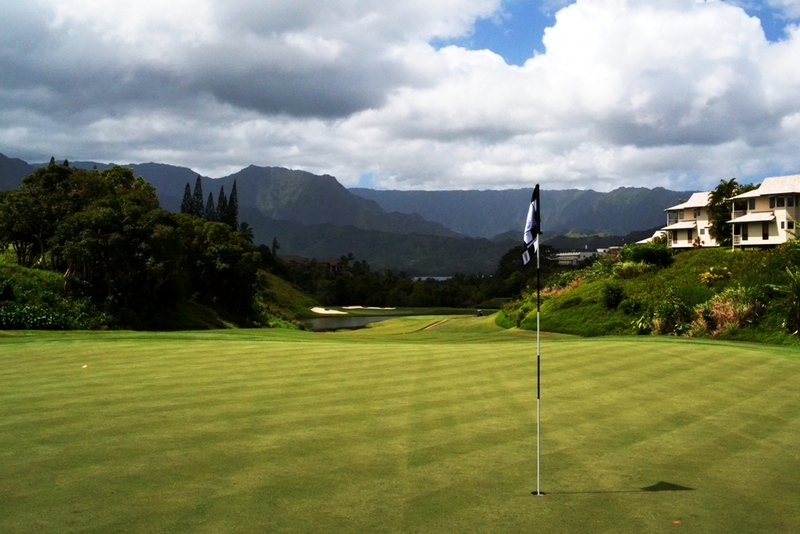 Princeville Makai goes above and beyond by making a golfer feel like a VIP. On the back nine, an attendant serves the juiciest fresh pineapple slices to recharge your taste buds and round. Upon finishing the 18th hole, golfers are refreshed with a cold towel that is presented in a miniature outrigger canoe. The ultimate capper to a great day of golf is sampling a secret recipe Makai Mai Tai on their outdoor patio. The dedication to making your Princeville Makai golf experience something special is evident in the people you meet at this course which underwent a $6 million renovation in 2010. From the early morning aura of Yoga leader Tulasi Adeva, to the bilingual banter of starter Hidecki, to the smiles from Pineapple Steve on the back nine, to the aloha spirit of GM Doug Sutter, Princeville Makai is a golf course with personality plus. If you have any doubt how much this crew loves golf, ask Sutter what he and his wife named their newborn son. A hint can be found on each of your “Calloway” rental clubs. 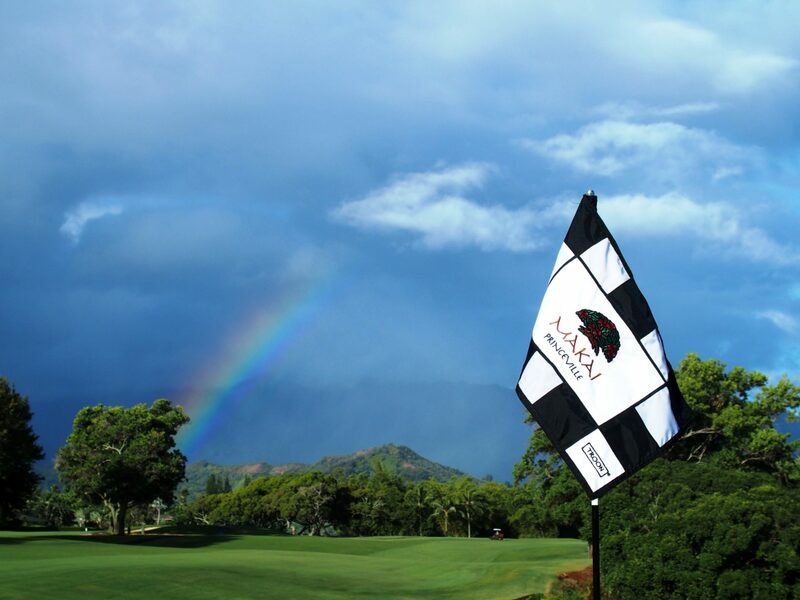 The Princeville Makai Golf Course in Kauai is your sunrise, to sunset, to first born son’s best bet for Hawaiian golf.